As a parent/grandparent of several baseball and softball players I always wanted to be able to keep track of baseball games whenever our team played in fields that lacked detailed scoreboards. At one point I purchased a scorekeeper app for my phone, but I was not happy with how it functioned (couldn't subtract hits, runs, etc. once I incremented them). However, it was better than no app at all so I continued to use the score tracker for the remainder of the season. However, as the baseball season approached, I noticed that my scorekeeping app quit functioning all together. So I thought it was a good time to attempt to make my own scorekeeper application. 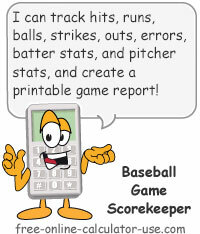 The baseball scorekeeper on this page is my first attempt at the mobile web-app version. Track the score, plues the inning, runs, hits, errors, outs, ball, and strikes. Track all of the above, plus the individual batting and pitching stats for players on both teams. Please let me know in the feedback form beneath the scorekeeper if you run into any issues while using the it. Keep track of a baseball game score, plus optional inning, batting, and pitching stats. any gray or green heading for popup instructions. This section is for keeping track of outs, runs, hits, errors, and batter counts for each half inning. If you are not concerned with tracking batters and pitchers, then this is the only section you will need to concern yourself with. Runs, hits, and errors will be reflected in the top scoreboard section. Tap the green cell under Top or Bottom to advance to the next half inning. Tap the red cell under Top or Bottom to go back to the last half inning (outs won't change but batter counts will be reset to zero). This cell will display the jersey number of the current batter. If the jersey number hasn't been set, the number will be the batting order number. This label will display either TOP or BOTTOM and the green cell beneath it will display the inning. Tap the green cell to go to the next half inning. Tap the red cell to go the last half inning. Changing the half inning will also change the batter and pitcher sections to the matching Visitors/Home combination. The green cell will list the number of outs for the current half inning. Tap the green cell to increment the number of outs (maximum of 2). Tap the red cell to decrement the number of outs (minimum of 0). Note that this field will increment automatically if the selected batter result in as out. The green cell will list the number of runs scored for the current half inning. Tap the green cell to increment the number of runs (will also add RBI's to the current batter). Tap the red cell to decrement the number of outs (will also subtract RBI's from the current batter). Runs will also be displayed and totaled in the scoreboard at the top. The green cell will list the number of hits recorded for the current half inning. Tap the green cell to increment the number of hits. Tap the red cell to decrement the number of hits. Note that this field will increment automatically if the batter result was a hit. Hits will also be totaled in the scoreboard at the top, and will be reflected on the pitcher stats in the game report. The green cell will list the number of errors recorded for the current half inning (charged against the team in the field). Tap the green cell to increment the number of errors. Tap the red cell to decrement the number of errors. Errors will also be totaled in the scoreboard at the top. The green cell will list the number of balls recorded for the current batter. Tap the green cell to increment the number of balls (maximum of 3). Tap the red cell to decrement the number of balls. Balls will also be added to the pitcher stats at the bottom. The green cell will list the number of strikes recorded for the current batter. Tap the green cell to increment the number of strikes (maximum of 2). Tap the red cell to decrement the number of strikes. Strikes will also be added to the pitcher stats at the bottom. The green cell will list the number of 2-strike fouls recorded for the current batter. Tap the green cell to increment the number of 2-strike fouls (strikes should be 2). Tap the red cell to decrement the number of 2-strike fouls. 2-strike fouls will also be added to the pitcher stats (as strikes) at the bottom. This section will appear for the top half of each inning and is for recording visitor batter stats. The number following the label indicates which place in the batting order the batter represents. The ratio following the batting order number is the number of hits vs the number of at bats, followed by the number of plate appearances. Hits are recorded for singles, doubles, triples, and home runs. At-bats are recorded for all results except for walks and sacrifices. Plate appearances are recorded for all results. For each batter, edit the jersey number as needed, select the result, and then tap the green cell to move to the next batter in the order. Upon moving to the next batter, hits or outs will be adjusted in the INNING section, and strike outs and walks will be adjusted in the Pitcher section. You may also add a note for put-outs (F8, 6-3, etc.). Tap the red cell to move back a batter to make changes (WARNING: changes to previously recorded batter results may skew other stats). The number in the field beneath this label displays the jersey number of the batter up to bat. Initially the jersey number will be the same as the batting order, but once you edit the field the scorekeeper will maintain the jersey number for the next time the batter is up to bat. If a batter is later benched, enter the jersey number of the new batter in that batting order position. The number in the field beneath this label displays the number of RBI's recorded for the current batter as of their last at bat. RBI's are added to this field anytime Runs are incremented in the INNING section while this batter is the current batter. You may also edit the number of RBI's manually as needed. If the batter hits the ball but is put out by the defending team, you can use the optional field in this column to add the abbreviation for the put out (F8, 6-3, etc.). Put-out abbreviations will be added to the game report for each at-bat they are entered for. This section will appear for the bottom half of each inning and is for recording home batter stats. The number following the label indicates which place in the batting order the batter represents. The ratio following the batting order number is the number of hits vs the number of at bats, followed by the number of plate appearances. Hits are recorded for singles, doubles, triples, and home runs. At-bats are recorded for all results except for walks and sacrifices. Plate appearances are recorded for all results. This section will appear for the top half of each inning and is for recording home pitcher stats. At the start of the game, leave Starter selected and enter the starting pitcher's Jersey #. If another pitcher comes in to relieve the starter, select the next choice in the drop-down menu and enter the reliever's Jersey #. Tap the green cells to increment the pitcher stats. Tap the red cells to decrement the pitcher stats. NOTE: Changes to this section will not be reflected in batter's pitch count, however, the changes to the batter's pitch count will be reflected in the pitcher stats. The number in the cell beneath this label displays the total number of balls thrown by the current pitcher. In order for this field to remain accurate, you must record all balls for each batter in the INNING section. You can also adjust the number of balls manually by either tapping the green cell (increment) or the red cell (decrement). The number in the cell beneath this label displays the total number of strikes thrown by the current pitcher (including 2-strike fouls). In order for this field to remain accurate, you must record all strikes and 2-strike fouls for each batter in the INNING section. You can also adjust the number of strikes manually by either tapping the green cell (increment) or the red cell (decrement). The number in the cell beneath this label displays the total number of pitches thrown by the current pitcher (all balls, strikes, and 2-strike fouls). In order for this field to remain accurate, you must record all balls, strikes, and 2-strike fouls for each batter in the INNING section. You can also adjust the number of pitches manually by adjusting the balls and strikes to the left of this cell (changing the count will not be reflected in the balls and strikes cells). The number in the cell beneath this label displays the total number of strike outs recorded for the current pitcher. In order for this field to remain accurate, you must record the strike outs for each batter in the Batter section. You can also adjust the number of strike outs manually by either tapping the green cell (increment) or the red cell (decrement). The number in the cell beneath this label displays the total number of walks recorded for the current pitcher. In order for this field to remain accurate, you must record the walks for each batter in the Batter section. You can also adjust the number of walks manually by either tapping the green cell (increment) or the red cell (decrement). This section will appear for the bottom half of each inning and is for recording visitor pitcher stats. At the start of the game, leave Starter selected and enter the starting pitcher's Jersey #. If another pitcher comes in to relieve the starter, select the next choice in the drop-down menu and enter the reliever's Jersey #. Tap the green cells to increment the pitcher stats. Tap the red cells to decrement the pitcher stats. NOTE: Changes to this section will not be reflected in batter's pitch count, however, the changes to the batter's pitch count will be reflected in the pitcher stats. The game begins in the top half of the 1st inning, with the Visitor inning/run cell highlighted. Whenever a run crosses the plate, tap the green Runs cell to increment the number of runs. At the end of each half inning, tap the green TOP/BOTTOM cell to advance to the next half inning. In addition to incrementing the runs scored, you can also increment Hits, Errors, Balls, Strikes, and 2-Strike Fouls. Note that Out and Strikes automatically revert back to zero on the 3rd increment, and Balls reverts back to zero on the 4th increment. For each batter's first plate appearance, enter the Jersey Number and the scorekeeper will save that number to the batting order for the next time the batter is up to bat. If an existing batter is replaced by a substitute, change the Jersey # for the batting order to the substitute's number. For each batter's plate appearance, select the result of the appearance from the Batter Result menu, record any RBI's that occurred, and if applicable, enter the put-out abbreviation. Then tap the green button to record the result and display the next batter in the batting order. Enter the Jersey Number of the starting pitcher for each team as they appear. Change the pitcher selection and Jersey Number for each subsequent reliever. Pitching stats can either be incremented manually, or if you are keeping up with the inning and batting stats, the pitching stats should increment automatically. You can view the game report at any time by clicking the "Game Report" button located beneath the scorekeeper. Tap any section or column label to see the balloon help for the label's contents. Important If you are using the latest version of your web browser software, the Baseball Scorekeeper will save all stats to your web browser's local storage (create a new data record for each game under the Data tab. The following abbreviations will appear in the printed game report.